Cerner Corporation (Cerner) is a $5+ bn supplier of healthcare information technology. Cerner offers a range of intelligent solutions and services that support the clinical, financial and operational needs of organizations of all sizes. Bergmann Group (Bergmann) is a design & manufacturing company based in Phoenix, Arizona that manufactures products for the healthcare industry under several different brands including Waterloo Healthcare and Phoenix Long Term Care. Bergmann also manufactures custom products for OEM customers in the healthcare industry. One of the hardware products that Cerner offers is the RxStation Automated Medication Dispensing Cabinet, which provides a single formulary across a health system to help nurses and pharmacists safely and efficiently manage medication dispensing and administration. Cerner was looking for an existing product that could be modified to fit its specific needs: They wanted to offer similar medication dispensing and administration inside of an operating room via a mobile platform. They had a definitive timeline and budget, and considered an expansive list of available products on the market before selecting Waterloo Healthcare, one of Bergmann’s companies, as the best candidate for their needs. After successful collaboration, prototyping, and testing between Cerner and Bergmann’s development teams, the RxStation Anesthesia Cart became generally available in 2017. 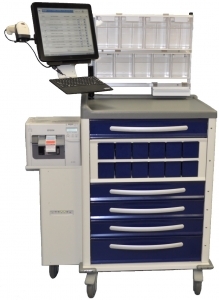 This product is a modified version of the Phoenix LTC “StatSafe” product, but utilizes Cerner’s advanced technology to control access to the Anesthesia Cart drawers and bins while fully integrating with Cerner’s core product line.